If the flower rims are bored, but you want to somehow refresh your image, add tenderness, lightness, bright colors, summer, you can use live flowers! Live flowers have an incredible ability: decorate any hairstyle and make your image captivating and unforgettable! This decoration of the hairstyle will fit not only the bride at the wedding, but also for photo sessions, evening walks, and for no reason! After all, the pretentiousness and elegance of hairstyles with interwoven vivid colors depends first of all on the complexity and intricacy of the hairstyle itself. Decorating a hairdo with fresh flowers: Is it difficult? 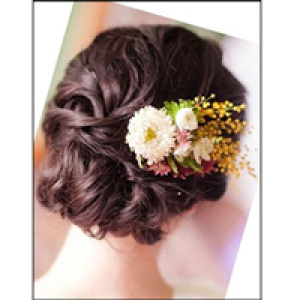 Usually, bud roses, lilies, orchids, lilies of the valley, chrysanthemums, eustoma, peonies are used to decorate hair. But you need to know some subtleties. For example, the orchid and lily are very "sensitive" to the surrounding temperature and weather. If it is very cold outside, they will lose their presentable appearance after an hour or a couple of hours. On this, the most reliable ornaments of hairstyles are roses. They are considered to be the most resistant to various temperature changes and weather changes, and also remain fresh and do not fade longer. If you have already chosen those flowers that you want to weave into your hair, then you need to store them in the refrigerator, but away from the fruit, so as not to speed up the wilting of the flowers you have chosen. After all, fruits produce ethylene, which accelerates the wilting process, so be careful even with such trifles. If you chose such a hair ornament for a wedding, then remember that such a flower decoration should be like a fragment of your bouquet of the bride. That is, if it consists of delicate cream roses, then exactly the same roses should be woven into the hair. Flower hair ornament and your bridal bouquet should create a harmonious composition. We process flowers for the hairstyle ourselves: where to start? After buying flowers you need to prepare them for your future hairstyle. To do this, it is necessary to cut off the stem with a knife (the scissors are undesirable to use, can squeeze the stem, after which the water will be poorly absorbed). Cut the stem at an angle. It is important to remember that the length of the stem should in no case be less than the length of the bud itself. After the stem is trimmed, the flowers should be put in water at room temperature. It is also recommended to add a special liquid to the water, which will give freshness to the flowers. This liquid is sold in every flower shop. A tablet of aspirin or a spoonful of sugar can be an excellent substitute for such a liquid. After your hair is ready, remove the flowers from the water and pat the stems with cotton wool soaked in water with aspirin / sugar or a special liquid. This wet cotton wool should be placed near the stems and fixed with teplenta (floristic scotch tape) or ordinary food film, which should be fixed with a silicone rubber band. It is necessary that the moisture inside does not evaporate, and the flowers do not spoil your hairdo with its wilting or loss of freshness. It is also recommended to sprinkle the chosen flowers with varnish, so they will keep their freshness longer. Next, depending on the hair, weave or fasten the flowers, fixing them on the hairstyle with the help of hairpins, while engaging them for silicone rubber. It is important to choose the right flowers. It is necessary that they look harmonious with your hair. If the hairstyle consists of small elements, do not select large flowers, choose small and quivering. And the main rule is, do not use too many colors to decorate your hair, all is well in moderation, remember this!